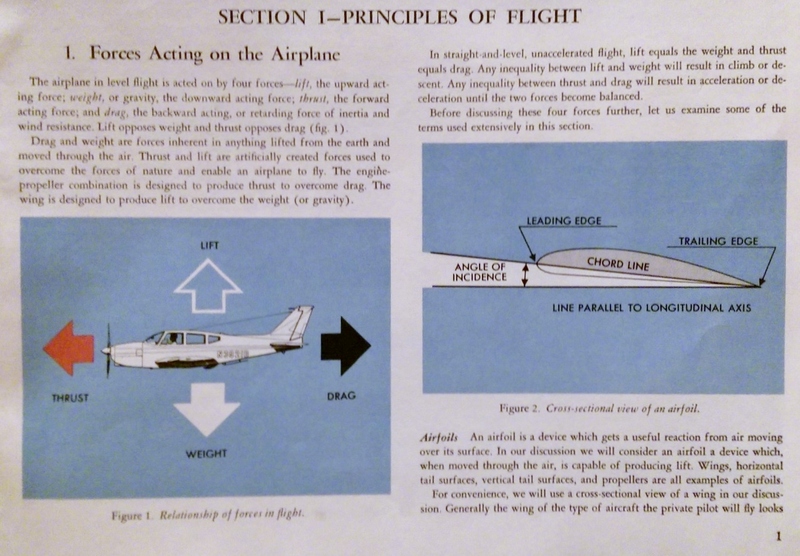 It’s from a 1963 publication called Facts of Flight: Practical Information about Operation of Private Aircraft, which was available for 50 cents from the U.S Government Printing Office. Luann found it at a thrift shop the other day, and I can’t decide what’s most charming about it. The saturated colors remind me of the children’s books I began bringing home from our public library in that same year. The graphics, quaint at first glance, turn out to be stunningly effective. The explanation of the physics of flight, equally effective, is the same as the one I got from my father who had flown a PBY Catalina during World War Two. This enjoyable and informative book is attributed to no author. It is simply “a manual prepared by the Flight Standards Service of the Federal Aviation Agency, to provide the private pilot with information essential to the safe operation of his aircraft.” I’m delighted to know that our government was once capable of writing an enjoyable and informative book. And I love the implicit message that any U.S. citizen could be an aviator in need of a pamphlet on atmospheric pressure, lift and drag, pitch, roll, and yaw, carburetor icing. Author Jon UdellPosted on 24 Oct 2015 24 Oct 2015 Categories . A…Bonanza? Cherokee? Can’t tell anymore. But it is nice, isn’t it? Clearer and more concise than the Jepsen flight-school textbook I had.